E is for Explore! 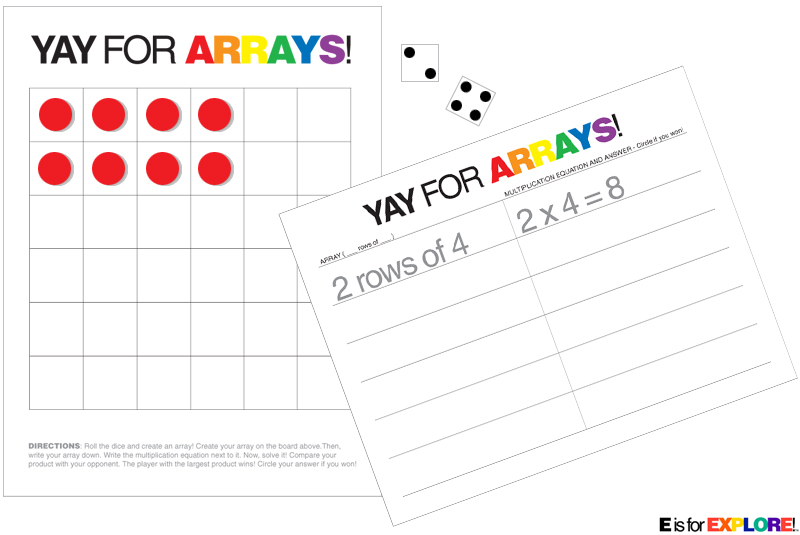 : YAY for ARRAYS! 2 player, dice game: Kids take turns rolling two dice. They use the numbers the dice land on to create an array on a grid, using number counters (or cheerios, paperclips, etc.). After they make their array, they write it down (ex: 2 rows of 4). Then, they write the multiplication equation down and solve it. They compare their answer to their opponent's. The player with the largest product wins and circles his answer. They continue playing. Then, when they're finished, they count up the total number of times they won. Whoever won the most is the overall winner!